It’s Never Too Early to Develop Good Knowledge Management Habits! 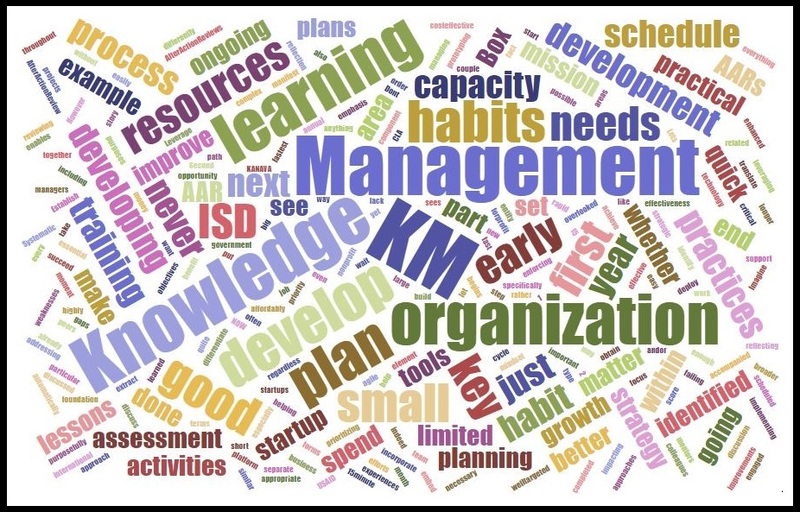 Any organization, no matter how big or small, no matter its mission, and regardless of whether it is a for-profit, non-profit, government entity or anything in between, can benefit from Knowledge Management (KM). The effective management of knowledge that is critical to the organization should be a priority for organizational growth. Small early investments in the form of good KM habits pay off quickly and build organizational strength and sustainability in the long run. It all begins with the development of a learning mindset. In short, it is never too early to develop good KM habits, even within small organizations and start-ups. 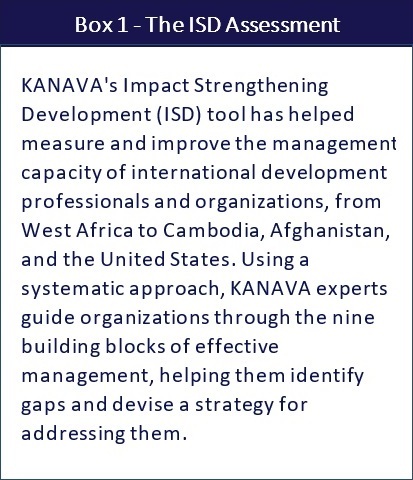 KANAVA sees KM as a key element of its ISD component on Organizational Management, with its emphasis on helping the organization achieve its mission and more specifically its strategic objectives. As an important area that is often overlooked, it is an opportunity for an organization to differentiate itself and make the most of its resources. First, KM is often perceived as something relevant for large organizations dealing with much more complex knowledge ecosystems. Why wait until everything is more difficult? It is much easier to start thinking about KM when the organization is still small. The added advantage is that in small organizations, it is the fastest way to succeed. Agile organizational learning, which can manifest itself through rapid prototyping, failing fast, and applying a rapid learning cycle, will be most effective when applied early in the organization’s development to support rapid growth. Second, the perception that Knowledge Management requires large investments in KM platforms (meaning IT systems) can scare away small organizations. The reality is that success comes from deploying Knowledge Management practices rather than KM platforms per se. KM practices are very scalable and many can be started in the context of small teams. What Can Small Organizations Do? · Establish good KM habits NOW. Don’t wait until the lack of KM is impacting the organization’s effectiveness and capacity to grow. · Leverage Knowledge Management to improve all the other areas of organizational capacity so that the organization can growth faster and stronger. In fact, an ISD assessment can help identify a well-targeted strategy for prioritizing Knowledge Management efforts. Let’s take a practical example. Imagine for a moment that you have just completed your first ISD assessment (see Box 1) and you have identified a couple of weaknesses in financial management. In particular, you have not been developing an annual operational plan. Financial management is a critical area of organizational capacity and you want to improve your ISD score by addressing some of the gaps that have just been identified. You can build your capacity related to operational plans through additional training, but is that going to be enough? Training is just the first step and a necessary foundation, but it needs to be accompanied by ongoing learning from doing (learning from experience). Further, experience does not automatically translate into learning. It needs to be enhanced through appropriate Knowledge Management practices, such as After-Action-Reviews and other forms of lessons learned approaches that support reflecting on your experiences in order to extract key lessons. Systematic learning on the job, with colleagues, mentors, peers, and managers, is part of a broader Knowledge Management and Organizational Learning strategy. How would that manifest itself in practical terms? Once you obtain additional training in operational plans, you put together a small team, develop your first operational plan, and start implementing it. That could be the end of the story until next year when you develop a new operational plan. However, a good KM habit to develop would be to purposefully schedule a quick (15-minute) After-Action-Review (AAR) or similar reflection activity every month to discuss how the implementation of the operational plan is going and what could be done differently to make it work better. Then, at the end of the year and before the development of the next operational plan, you could schedule a longer discussion, reviewing everything that has been discussed in the short AARs throughout the year to make improvements to the planning process and the next plan. The key is to embed AARs and/or other learning activities in existing processes (like the operational plan planning and implementation process) so that they are part of a scheduled set of activities and not a separate KM activity. 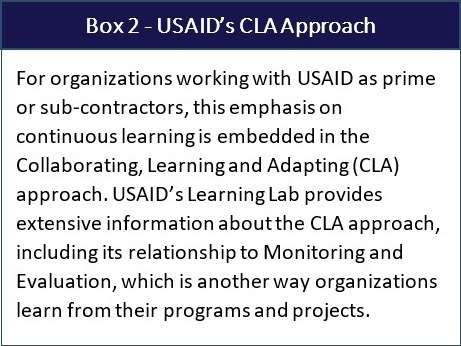 USAID, for example, does this through its CLA approach (see Box 2) to develop KM habits within international development projects. Once it’s embedded in a schedule, it can more easily become a habit and it’s never too early to develop good KM habits. Embedding KM practices in existing processes also enables the leveraging of resources already engaged, without adding layers of requirements. What is the cost of adding 15 minutes of AAR in the agenda for a monthly staff meeting? Not much. What’s the value of developing this KM habit? Priceless. Is there a magic threshold in size or revenue at which point KM becomes relevant or indispensable in an organization? No. KM is relevant for the solo entrepreneur, the five-person start-up and larger organizations. As an organization grows, its KM needs to adapt and evolve. When core KM habits are embedded early in the organization’s processes and procedures as well as in its overall organizational culture, KM can evolve so that it supports the organization’s growth and facilitates a smooth and ongoing process guided by continuous learning. Need help thinking through how to start your Knowledge Management efforts? Contact us. Dr. Barbara Fillip is a Senior Organizational Development Advisor with KANAVA International and President of Fillip Consulting, LLC, helping individuals, teams, and organizations accelerate their learning to continuously adapt to change and improve performance.